MOODINS - Moodboards, Interiors and Stories by szaboesz: Spring is here! 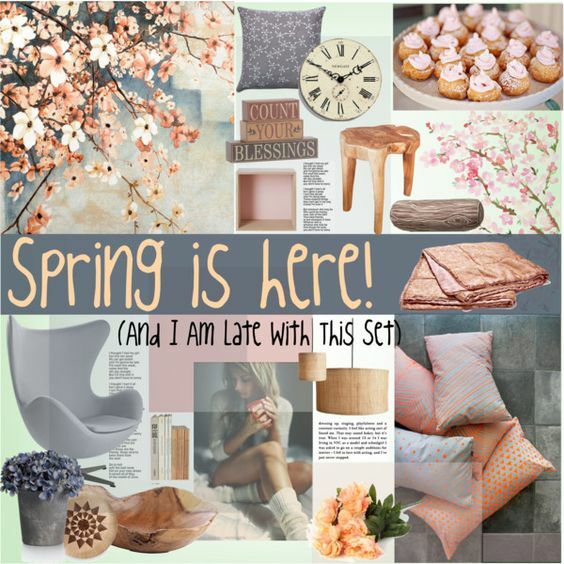 As spring is slowly passing away, I am definitely late with this moodboard. Spring is a grateful theme for stylists, as it can be used in so many ways - the abudance of colours makes it possible to create many vivid and lively combinations. Today's colour scheme is pink, peach and warm light brown against steel grey, with just a touch of light green. The image I had in my mind was a young girl, walking in the park of a big city with high-rise bulidings. I saw an early April scene, the blossoming trees, the raindrops on the grey pavement, the barely green lawn streching towards the skycrapers, the glass windows reflecting the light coming through the clouds, the air is crisp and cool after the early spring shower... and how does the home of this girl look like? Modern urban furniture in soft colours, some interesting handcrafted items, lots of cushions to lean against while studying for her exams. Some of her furniture are inherited perhaps (as an original Arne Jacobsen chair is not something a college student could afford), others are newly bought, mixmatched in style but coordinated in colour. Alltogether it is a very feminine and chic style - the chair is a good foundation for other styles she might want to try later on in her life. I create interior moodboards and blog about it. All moodboards are my creations. Copyright by szaboesz.. Simple theme. Powered by Blogger.